+1. Would like us to use him like how Seattle used Michael Bennett. He was an end on base downs but he kicked it to the inside and was able to be a factor there as well. Pull up your lane Bryant skirts up! DM. Where my ohhhhs at. Jay and Papa get ready baby girls. Mods, can you please ban this buffoon?? Teams shy away from blitzing heavily against us because McVay is amazing with the screen game. We burned teams last year when they tried to blitz the heck out of us. Teams have been more conservative this year. As for the run defense, I think people are running with a narrative that might not be so true. Our run defense has held the opposition to less than 100 yards rushing in 4 of our 6 games this year. We had a dreadful game against the Seahawks. I still can't really explain that one. Our best run defender, Michael Brockers, was absolutely terrible in that game. And we had a bad game against San Diego. We shut down arguably the best rushing attack in the NFL last week in the Broncos (IIRC, they were top 5 in rushing yards and #1 in YPC coming into the game). As for TEs, they haven't had much success against us since Barron returned, but we also haven't been truly tested. Kittle will probably have a good game because he's a very good to great TE, but I think we're not as weak there as many believe (based on a nationally televised Week 1 disaster when Barron was out). Our big weakness is our #2 CB. Troy Hill is vulnerable to getting beat over the top. If you can get Goodwin on him, that's a matchup you can exploit. Sam Shields is much better in coverage, but he's a liability against the run. Strange. You weren't this talkative before this year. I wonder why. Holy crap what a dumb condescending comment. years ago some niner fan ninerfan4life or something like that. sig bets regarding who won the west. For years I took that bet. And for years I knew we would never win. Now it’s my turn! Chin up. Chest out. Guns out. its time to flex on y’all who use to flex on the Harbougs days. Specially j. And last year was last year. BUT TODAY I GOTZ TIME. I don't know who you're talking about. And I don't care about sig bets. I'm talking about you essentially acting like a goon that only comes out of the ether when your team finally gets it's act together after years of ineptitude. Like I said above. No flex zone. You're a cancer to this forum, and the worst type of sports fan. it doubt go for low blows. With that im out good luck San Fran and stay healthy boys. Half the dudes in here know im only kidding. I’ve been super chill for ever. But that wasn’t nice to say and something I’ll never say. Perfect! You won't be expecting it and will have other plays called besides screens. We run zone blitzes. We will show blitz, Goff will audible to a screen, we will drop back and the screen will get swallowed up. Part of that will be guys who are supposed to blitz recognizing that it's actually a screen, and then adjusting. Our DL is pretty athletic and our LBs are playing good ball. If a guy like Buckner recognizes a screen to his side, he can clog throwing lanes and take the whole play down by himself with that 6'7" frame. We've gotten stung when teams throw the ball downfield. I think forcing the ball to come out more quickly will only be to our benefit. As long as gurley is accounted for at all times, I don't really see the screen game killing us. Tackling has been an issue but it has gotten significantly better in the past 2.5 weeks. Gurley is the key to the whole offense. We need to put a man or two on him at all times. Force the ball to go elsewhere. I think it's a bad matchup for your defense, schematically. The outside zone run leaves certain guys completely unblocked and is based on the speed to get the edge. We hook your OLB, chip your DE then get outside leverage on your inside linebacker on that side. The other linebacker is completely unblocked but is too far away to catch breida or mostert. Suh and Donald simply don't have the speed to chase down either of these runners, so it negates your biggest advantage. When defenders try to get too far outside to get a head start, we will start cutting it back (and then blocking that other inside linebacker who was untouched before). It will have you on your heels from the jump. We started running inside tosses, looked like a toss to the outside but when the runner immediately turned up field and went through the A gap or looked for a cutback lane once he caught the ball. We used to run toss counters under harbaugh and this was a similar concept, it was a good wrinkle. We've been gashing teams with it all season. Our biggest rushing games have come against 3-4 teams (DET, GB). I really wasn't a big fan of the outside zone run until the end of the last season, I have always been partial to a power blocking scheme, but it's really starting to make a ton of sense as the team is getting better at executing Kyle's offense. Everything else works off of the outside zone run. The niners are a young team with young coaches who are still figuring things out. If we could stop turning the damn ball over we might actually win some damn games. We've turned it over more than anyone else and gotten less takeaways than any other team. You'll never guess who is #31 on that list but Jacksonville has 5 take aways (we have 3) and they have turned it over 14 times (which is tied with us for most). Anyways. Eat dirt this weekend. Showing blitz isn't enough to get us to screen. We start using the screen as a weapon when the opposing team is actually blitzing. McVay figures out their tendencies and times them up. And we don't just use screens. We'll find ways to sneak Gurley out of the backfield into space. 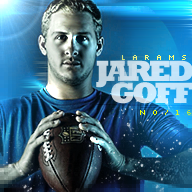 IIRC, Goff has a passer rating of 100+ this year when blitzed and had a passer rating of 100+ last year when blitzed. Plus, Gurley is quite arguably the best pass protecting HB in the NFL. That also helps immensely with our blitz pickups. Accounting for Gurley in this scheme is easier said than done. And frankly, the idea that Gurley is the key to the offense is a bit antiquated. Gurley is our most valuable offensive player, but the teams who sold out to take him out of the game have been ripped apart by our passing attack this year. The problem with the outside zone is our defense's speed is our strength. Seattle ran all over us by overpowering us at the POA. Donald is so quick into the backfield that he can blow up those off-tackle runs. And he is fast enough to run down your HB behind the LOS. You're running game might work, but I think you're underestimating our run defense. Donald is such a weapon against horizontal runs. The best play to neutralize him is to run away from him on plays that get to the LOS quickly. If Brockers and Suh have a bad day, you can run all over us because Donald can't get upfield quickly enough on every play to blow it up. That's not to say we'll shut you down. Our run defense is hit and miss. You may have a big day running the ball. But I think your scheme plays more into our defense's hands. But boy oh boy, I don't envy Beathard. He's got Person or Tomlinson trying to block Aaron Donald lol. Our FB isn't much of a pass catcher. He isn't much of anything actually lol. (I don't think we have a FB) So I'll give you that one for sure. Well, no offense, but I hope you guys keep the negative turnover differential going this week. Well, no offense, but I hope you guys keep the negative turnover differential going this week. I'm so frustrated with the turnovers at this point, I almost feel like I'd be happier with a game we get blown out in but have no turnovers compared to a game we keep close but turn the ball over three times in again. It's very frustrating to watch all of the turnovers.